We're hiring! Check out our latest vacancy for a Brass Specialist. It sounds pretty bonkers, but Russell is serious... to achieve all possible Grade 8s in the Trinity Exam series. Back in 2013 John Packer provided Russell with a John Packer brand Trumpet, Tenor Horn, Euphonium, Trombone, bass Trombone and Tuba to undertake six Grade 8s on one day. The feat saw him raise more than £5k for Cancer Research UK. He's hoping to raise even more and raise awareness about the importance of music education with an even bigger challenge. "I'm definitely dreaming bigger with this project, if all goes well I can see this project consuming my life for the next few years. I hope for it to become a much more engaging and multifaceted project which can address some very real issues in music education nationally and raise even more money for charity." There are more than 30 instruments covered in the Trinity grades including piano, organ, classical singing, harp and jazz flute, clarinet and saxophone exams. To save his embouchure - and because this is a much bigger challenge, Russell is going to split the exams into groups and have a period of focused learning for each group. "I have always considered myself to be a multi-instrumentalist, however this has been largely limited to brass instruments, saxophone and guitar instruments. I have a basic working knowledge of many other instruments but accept that this is a serious undertaking which could take a longer period of time to achieve." John Packer is delighted to be supporting this challenge which will showcase the John Packer range of instruments, including French horn, soprano cornet, flute, clarinet, oboe, bassoon, saxophone and recorder! When he reaches the appropriate standard to do the exams he will then move onto the next group. "Having worked as a music teacher (classroom and peripatetic) for the entirety of my career, music is increasingly becoming inaccessible to many lower income families across the UK; funding is being cut to music services on a regular basis and schools are unfortunately seeing music as a "luxury" which in many cases they can't afford to subsidise. This means that the cost of instrumental lessons is largely entirely passed on to parents meaning that lower income families are unable to access instrumental lessons. With also not being included in the English baccalaureate assessment data, there is now early evidence to suggest that the uptake of music as a GCSE option has massively decreased. "I am passionate about this not only because I am a music teacher, but because had this been the situation when I was a child, I would certainly not be in a position to send this email to you. I was bought up with very supportive parents, but in abject poverty. I have two sisters and a brother and we were all able to have instrumental lessons from our local music service and as a result two of us now work in the music industry. I feel this could be an excellent platform with which to help promote the many virtues of music education of which only those that have benefited from it know the full extent." 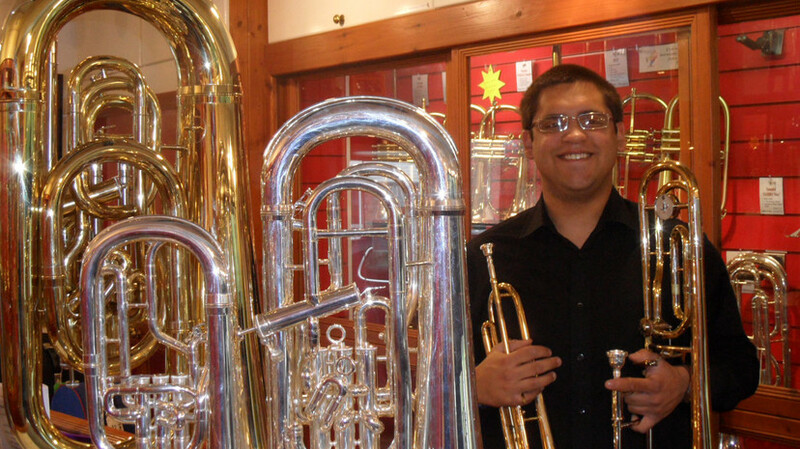 On his journey Russell is hoping to receive masterclasses with prominent figures in the business, and showcase the John Packer instruments he uses along the way. He's also hoping to reach out to budding musicians and create new playing opportunities for local communities. PHOTO: Russell back in 2013 trying out John Packer instruments.